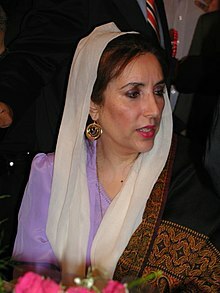 Benazir Bhutto (Sindhi: بينظير ڀٽو‎; Urdu: بے نظیر بھٹو‬‎, pronounced [beːnəˈziːr ˈbʱʊʈʈoː]; 21 Juin 1953 – 27 December 2007) wis a politeecian an stateswoman who served as the 11t Prime meenister o Pakistan in twa non-consecutive terms frae November 1988 till October 1990, an 1993 until her final dismissal on November 1996. She wis the eldest dauchter o Zulfikar Ali Bhutto, an umwhile prime meenister o Pakistan an the foonder o the Pakistan Fowk's Pairty (PPP), which she led. In 1982, at age 29, Benazir Bhutto acame the chairwoman o PPP – a centre-left, democratic socialist poleetical party, makin her the first woman in Pakistan tae heid a major poleetical pairty. In 1988, she acame the first woman electit tae lead a Muslim state an wis an aa Pakistan's first (an sicweys far, anly) female prime meenister. Notit for her charismatic authority an poleetical astuteness, Benazir Bhutto drove initiatives for Pakistan's economy an naitional security, an she implemented social capitalist policies for industrial development an growthe. In addition, her poleetical philosophy an economic policies emphasised deregulation (parteecularly o the financial sector), flexible labour markets, the denationalisation o state-awned corporations, an the widrawal o subsidies tae ethers. Benazir Bhutto's popularity waned amid recession, corruption, an heich unemployment which later led tae the dismissal o her govrenment bi conservative Preses Ghulam Ishaq Khan. In 1993, Benazir Bhutto wis re-electit for a seicont term efter the 1993 parliamentary elections. She survived an attemptit coup d'état in 1995, an her haurd line against the tred unions an tough rhetorical opposition tae her domestic poleetical rivals an tae neighbourin Indie earned her the nickname "Iron Lady"; she wis an aa respectfully referred tae as "B.B." In 1996, the charges o corruption levelled against her led tae the final dismissal o her govrenment bi Preses Farooq Leghari. Benazir Bhutto concedit her defeat in the 1997 Parliamentary elections an went intae self-imposed exile in Dubai, Unitit Arab Emirates in 1998. Efter nine years o self-exile, she returned tae Pakistan on 18 October 2007, efter havin reached an unnerstaundin wi Preses Pervez Musharraf, bi whom she wis grantit amnesty an aw corruption charges wur withdrawn. Benazir Bhutto wis assassinatit in a bombin on 27 December 2007, efter leavin PPP's last rally in the ceety o Rawalpindi, twa weeks afore the scheduled 2008 general election in which she wis a leadin opposition candidate. The followin year, she wis named ane o seiven winners o the Unitit Nations Prize in the Field o Human Richts. ↑ Yusuf, Huma. "0 Coming of age in the Benazir Bhutto era". 18 January 2011 by Huma Yusuf. first appeared in The Boston Globe on 28 December 2007. Retrieved 18 November 2011. ↑ Ranjha, Khalid. "Altaf accuses Benazir of 'racism'". 01 June 1995. DawnWireService, 1 June 1995. Retrieved 18 November 2011. ↑ "Benazir Bhutto named among seven winners of UN human rights prize". UN. Retrieved 24 June 2010.